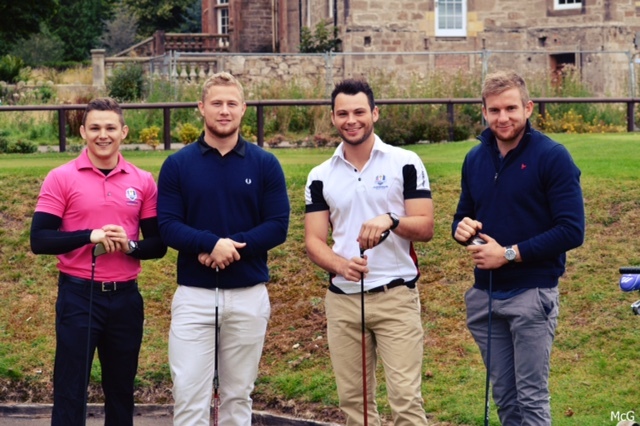 It was the annual Ayr RFC Golf Day at Belleisle on Sunday and while it was a successful round for some, others may want to brush up on their game for next year. Ex-presidents Gus McKay, Brian McNally and Andrew Pickles and their playing partner George Allan made up the winning four-ball. They won four tickets to Scotland's Six Nations match with France at BT Murrayfield. The best individual scratch score was recorded by Stuart Howie, with +6, winning him a voucher for the Balgarth Pines. The Famous Grouse sponsored the longest drives, which were hit by Dava Courtney and David Armstrong. Closest to the pin (sponsored by Kenny McPherson through Meridian, Caprice and the Ayrshire & Galloway) was Nigel Howard, with Gus McKay and John King tied for second. Richard Gordon, Belleisle's pro golfer, sponsored the worst individual scores. Blair Macpherson recorded an extraordinary +66, which isn't entirely surprising as he seemed to be under the impression that you hit the pin with the ball rather than get it in the hole. Kerr Gossman was also confused as to how to finish a hole, and Martin McHarg and David Parker will be taking some golf lessons in the near future. Grateful thanks go to Kenny McPherson for sponsoring the scorecards, the Balgarth Pines for hosting the post-round prize-giving and meal, and all the players who took part, no matter their score! Finally, thank you to Craig Gossman, Robbie Fergusson and Andrew Dunlop for organising the day.